This is the regular UK mortgage interest update for March 2013. The headline for this month is that the UK Government / Bank of England market manipulation scheme known as the Funding for Lending Scheme (FLS) is working. Last month’s update can be found here. Standard Variable Rate (SVR) mortgages. These continue to rise. Today they sit at 4.4%, up 0.03% month on month and 0.22% year on year. Lifetime Tracker mortgages. These also continue to rise. Currently they are 3.68% which is a monthly increase of 0.04% and a yearly increase of 0.11%. 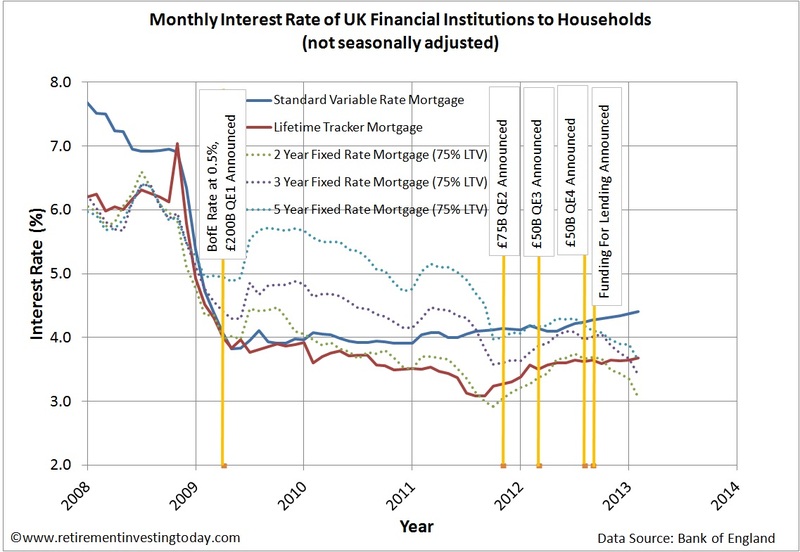 2, 3 and 5 Year Fixed Rate Mortgages with a 75% loan to value ratio (LTV) on the other hand are falling significantly. These are the mortgages you would expect to be affected by the Funding for Lending Scheme. This is because the Scheme is “theoretically” only available for a limited period. (As a reminder the scheme started on the 01 August. From this date Banks and Building Societies have access to the scheme for 18 months with the scheme allowing borrowing for a period of up to 4 years.) Today we see these mortgages at 3.06% (down 0.29% on the month, 0.21% on the year), 3.41% (down 0.26% on the month, 0.36% on the year) and 3.65% (down 0.24% on the month, 0.53% on the year) respectively. Since the scheme started the falls are 0.63%, 0.60% and 0.46% respectively. A history of these mortgage rates can be seen in the chart below which also shows the announcement dates of some of the well known schemes that have had a large effect on the market, namely a Bank of England Bank Rate of 0.5%, 4 tranches of Quantitative Easing and Funding for Lending. What this all means is that today an average 2 year fixed mortgage can be had for a real (inflation adjusted) rate of -0.22%. Yes you read that right. Mortgage rates in real terms are negative. 3 and 5 year real rates are also negligible at 0.13% and 0.37% respectively. The question is how much lower can they drive rates in nominal terms? I can’t see it being much further given that the Bank of England want and will do everything they can to engineer inflation. Tracking these rates for the next few months will give us a good steer. As UK house prices are all about affordability these lower rates should be giving a boost to the property market. Let’s then look at the Nationwide and Halifax House Price Indices which in terms of market timing are perfectly aligned with the FLS scheme. Since the scheme started on the 01 August 2012 the Nationwide tells us that nominally house prices have fallen 1.3% and the Halifax tells us that prices have risen 0.3%. Over the same period the year prior both indices showed falls of 1.9% and 2% respectively. The scheme has slowed or stopped the falls but a significant decrease in mortgage rates has not been able to kick start the property market. I wouldn’t be surprised to see a small blip upwards in prices coming into summer but I can’t help but feel it will be short lived. I still believe that prices in nominal terms are at peak. In amongst all of this though I just can’t see how the Bank of England is ever going to be able to take the crutch away without falls occurring. It’s supposed to be for 18 months only but I’m thinking that it must be either extended or replaced by another scheme. I also can’t see how even if they keep the schemes going they are going to be able to engineer increases. I only see stagnation at best as so far everything but the kitchen sink has been thrown at the property market and it’s made no discernible difference. On the other hand a small increase in mortgage rates could be the straw that breaks the camels back. The only change that I can see that would give a sustainable nominal boost to property prices is the same change that would enable the crutch to be slowly removed and that is earnings start to rise at a rate greater than inflation. Unfortunately I can’t see a repeat of the 1970’s as we now live in a globalised world where there are still billions of people prepared to work for a lot less than you and I. Therefore in my opinion earnings will increase at a rate less than inflation for a long time to come. This of course then puts further pressure on house price affordability as under this situation essential items like food, clothing and transport take up a larger and larger portion of take home earnings. This squeezes what’s left for shelter putting further pressure on prices. I remain out of the UK property market and am not even looking on Rightmove let alone talking to Real Estate Agents. Of course you should always do your own research. Do you have a different view? What are you doing? Very much hope you are right about falls recurring once the props are taken away. But for anyone in Southern England who did not benefit from the house price explosion of 1999-2004 the current situation is a conundrum. There are some telling graphs showing Southern England continuing to have extremely high price-to-earnings ratios, of 7 or 8, demonstrating how expensive residential property remains. In other parts of the UK, however, property is significantly more affordable. Does one take advantage of very low mortgage interest rates, but borrow a huge sum of money to buy an overpriced asset; or wait until interest rates rise in the hope that nominal falls will occur and one will need to borrow less? The risk is that the government will continue to stoke inflation which will feed through into property. For the time being I prefer to remain out of the property market, and am glad to have done so given the impressive equity returns of late. But I will be watching the property market with interest. Interesting point you make about the disparity in PE Ratios between regions. I believe I can actually build a regional PE Ratio dataset using ASHE and the Land Registry data as both present regional datasets. I just need to get a few hours carved out in my schedule to let me crunch the numbers. Its certainly something I'm also interested in reviewing and so it's on my post wish list. In respect of the question "Does one take advantage of very low mortgage interest rates, but borrow a huge sum of money to buy an overpriced asset; or wait until interest rates rise in the hope that nominal falls will occur and one will need to borrow less?". I now find myself in quite an interesting situation. Like you I'm out of the residential property market (or as I like to think about it, my potential home) but because I'm now 70% of the way towards Early Retirement I'm seeing an interesting situation develop. 100% includes enough cash to buy a house without a mortgage as well as have enough investments to provide financial independence. This already means my mortgage requirements are relatiely small but when coupled with my high savings rate and investment returns it means that every day that passes I need a noticeably smaller mortgage. This is then pushing me more towards buying on Value (PE Ratio) with less Affordability (which is heaviliy influenced by mortgage rates) influence as every day passes. Like you I also keep watching with interest from the sidelines though.